Abuja, Nigeria. July 9th, 2013 – Latest weekly poll results released by NOI Polls Limited reveal that almost 9 in 10 Nigerians (90%) believe the highest abusers of drugs and substance are teenagers and young adults aged between 15 and 29 years old. Furthermore, our results show that the most abused substance in Nigeria is marijuana followed by Codeine (Cough Syrup) and Alcohol (in whatever from). The key causes for the rise in drug and substance abuse are listed aspoverty and unemployment. These are the key findings from the drugs and substance poll conducted in the week of July 1st 2013. The World Health Organization (WHO) describes Drugs and substance abuse as “the harmful or hazardous use of psychoactive substances, including alcohol and illicit drugs”. It also refers to a condition in which a person consumes the substance in quantities or with procedures which are not approved or monitored medically. Substance and drugs abuse encompasses the use of “mood-altering or psycho-active drugs; illicit drugs – narcotics; stimulants; depressants (sedatives); hallucinogens; cannabis; glues and paints, Substance abuse often includes problems with impulse control and impulsive behavior”. Worldwide, there has been an increase in drugs and substance abuse especially amongst young adults, with no exclusion to Nigeria. In 2011 the United Nations Office on Drugs and Crime reported that Nigeria was top on the chart in drug/substance abuse in Africa. It also reported that Nigerians are the largest abusers of cannabis in Africa. Furthermore, the Nigerian Drug Law Enforcement Agency (NDLEA),which is in charge of monitoring and controlling the abuse and trafficking of illicit drugs, reported that within the period of 1999 to 2007 alone, about 2,267,830.53 kilograms of various illegal drugs and substances were seized all over Nigeria. On June 26th, the International Day against Drug Abuse and Illicit Trafficking was commemorated. This day is set aside by the United Nations to recap the goals established by stakeholder states towards eradicating drug abuse and attaining an international society that is free of drug abuse. This is done mainly by creating awareness and educating youths and adults on the hazardous and social effects of substance abuse and to guard against it. The effect of drugs on individuals and the society at large cannot be over emphasized. Drug addiction and substance abuse can be linked to various ill effects in the society. Several findings have shown that substance abuse to a large extent is directly related to the increase in crime and violence in the country. A number of abusers, especially youths and young adults, have been identified to be involved in armed robbery and daring exploits. Substance abuse has also been linked, to a certain level, to early school dropout and a number of HIV/AIDS cases due to the sharing of needles in the course of administrating drugs. Based on this background, NOI Polls conducted its latest poll on drugs and substance abuse in Nigeria in order to explore the awareness of Nigerians regarding the issue, in the areas of: the most abused drugs and substance in Nigeria; the predominant age group of abusers; causes of drugs and substance abuse, as well as remedies to curb the issue. Respondents to the poll were asked five specific questions. The first question sought to determine the opinion of Nigerians towards the level of drugs and substance abuse in Nigeria. In your opinion to what extent do you agree that there is a high level of drugs and substance abuse in Nigeria? In reaction to this the overall majority (91%: 44%+47%) agree that there is a high level of drugs and substance abuse in Nigeria. Comparatively, 5% do not agree and 4% remained neutral about the situation as they neither agree nor disagree to the high level of drug and substance abuse in Nigeria. 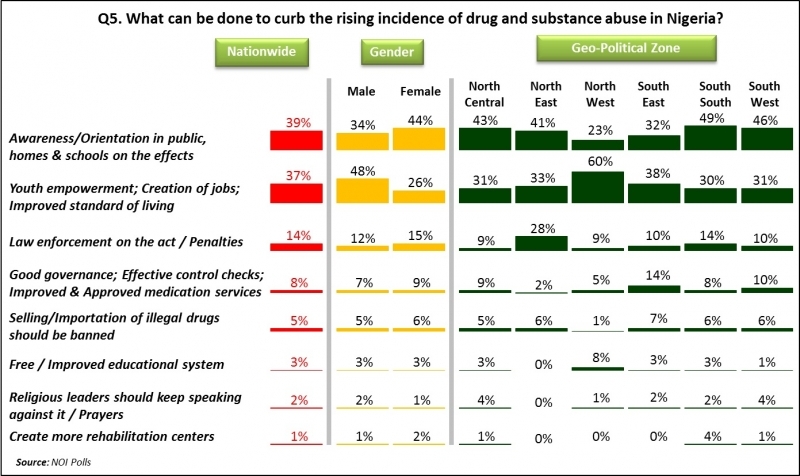 Analysis from geo-political zones revealed that the North-East zone (98%:50%+48%) and the North-West zone (96%:44%+52%) had the highest proportion of respondents who agreed that there is high level of drugs and substance abuse in Nigeria and closely followed by the South-East zone with 90%(43%+47%). In addition the South-South zone had the highest proportion that does not agree that there is a high level of drugs and substance in Nigeria. Subsequently, in order to gain an insight to the drugs and substances mostly abused in Nigeria, respondents were asked the following question: In your opinion, what drugs or substance is mostly abused in Nigeria? Findings from this question showed that the most abused drug and substance in Nigeria is marijuana, as indicated by the majority (34%). This finding further supports the statistics of the United Nations stating that Nigeria had the highest level of abuse of cannabis (marijuana) in Africa. The second on the chart identified by 22% of the respondents is codeine (cough syrup); this is followed by alcohol (20%), then tobacco with 9%, prescription drugs 9% and hard drugs being the least with 6%. 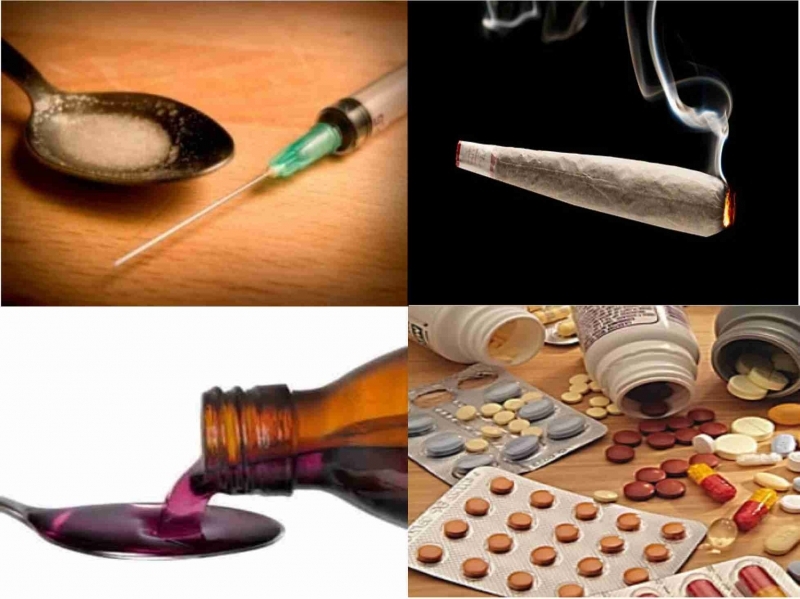 In exploring the most abused drugs and substances from the geo-political zones perspective, findings show that while theNorth-West zone accounted for the highest proportion of respondents (43%) that indicated marijuana as the most abused substance, the North-East zone had the highest proportion of respondents (62%) that indicated codeine (cough syrup) as the most abused substance. Addtionally, the South- East zone had the highest number of respondents (35%) that pointed out Alcohol as the most abused substance in Nigeria. Furthermore, the quest for more insight to the age category of drugs and substance abusers in Nigeria led to the following question: Among what age group do you believe drug and substance abuse is most common? Alarmingly, the results show that teenagers and young adults aged between 15 and 29 years are the most abusers of drugs and substance in Nigeria as indicated by the overall majority of respondents (90%: 57%+33%) where 57% indicated 19-29 years and 33% indicated 15-18 years. 7% of the respondents are of the opinion that drugs and substance abuse is most common in the age group of 30- 44 years, another 2% indicated 0-14 years and only 1% indicated 45-59 years. 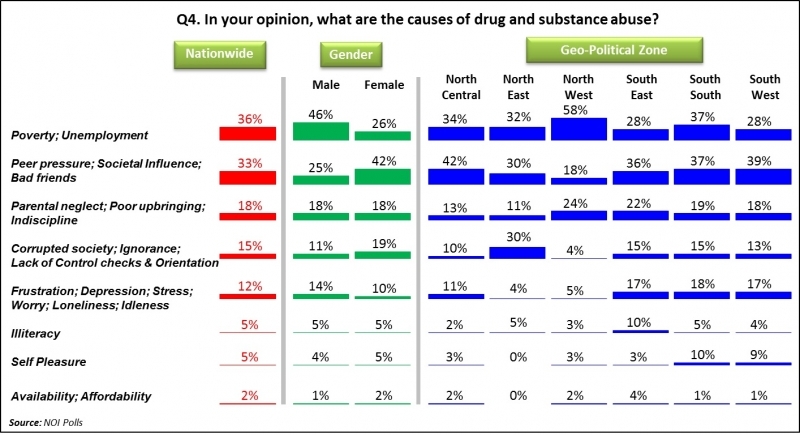 Analysis according to geo-political zones showed that the South-East zone accounted for the highest proportion of respondents (79%) that indicated 19-29 years as the most common age group with drugs and substance abuse in Nigeria; this is followed by the North-Central and South-West zones with 66% and 65% respectively. Also majority of respondents that indicated 15-18 years were from the North-East zone with 71% followed by the North-West zone with 44%. The fourth question sought the opinion of respondents on the possible reasons why people abuse drugs and substances:In your opinion what are the causes of drugs and substance abuse? From reactions of respondents the most significant cause of drugs and substance abuse as highlighted by the majority (36%) is “Poverty and Unemployment”. “Peer pressure, societal influence and Bad friends” also play important roles as causes of drugs and substance abuse as these came second on the chart with 33%. Other causes of drugs and substance abuse revealed from findings include“Parental Neglect, Poor upbringing and Indiscipline” indicated by 18% of the respondents, “Corrupt society, Ignorance and Lack of control checks and orientation” indicated by 15%, “Frustration; Depression; Stress; Worry; loneliness and Idleness” specified by 12% of the respondents. Reasons of drugs and substance abuse that came at the bottom of the chart include “Illiteracy” (5%), “Self pleasure” (5%), as well as “Availability and Affordability” (2%). Further analysis from geo-political zones showed that the North-West zone accounted for the highest proportion of respondents (58%) that pointed out “Poverty and Unemployment” as the major causes of drugs and substance abuse. Also majority of the respondents that indicated “Peer pressure; societal influence and Bad friends” were from the North-Central zone (42%). When the findings were analysed according to gender, interesting discoveries show that while more male respondents (46%) blamed “Poverty and Unemployment” as the major causes of drugs and substance abuse, more female respondents (42%) suggested that “Peer Pressure; Societal influence and Bad friends” were responsible for the rising occurrence of drugs and substance abuse especially amongst teenagers and young adults in Nigeria. Lastly in order to seek public opinion on measures that can be taken towards reducing the abuse of illicit drugs and substances respondents were asked: What can be done to curb the rising incidence of drugs and substance abuse in Nigeria? A slight majority of 39% are of the opinion that creating more “Awareness/Orientation in public, homes and schools on the effects” of drugs and substance to a great extent would reduce the rise in drugs and substance abuse especially amongst teenagers and young adults as stated in a previous question. Another group of the respondents (37%) suggested that “Youth empowerment, Creation of jobs and Improved standard of living” is paramount in curbing the situation. Furthermore, 14% of the respondents are of the opinion that more “Law enforcement and Penalties” will reduce the problem to its minimum; another 8% said “Good governance, Effective control checks, Improved & Approved medication services” would go a long way in curbing the rise in Nigeria. Other remedies that came least in the chart include “Selling/Importation of illegal drugs should be banned” suggested by 5% of the respondents, “Free/Improved educational system” indicated by 3% of the respondents, “Religious leaders should keep speaking against it Prayers”pointed out by 2% of respondentsand “Create more rehabilitation centres” indicated by 1% of the respondents. In summary, the results from this current poll have revealed that almost 9 in 10 Nigerians (90%) believe the highest abusers of drugs and substance are teenagers and young adults aged between 15 and 29 years old.It has also emerged true from this poll that the most abused substance in Nigeria is marijuana. Since poverty, unemployment, peer pressure, societal influence and bad friends came top as the major causes associated with the rising abuse of drugs and substance, thus, careful consideration should to be given to the creation of more awareness on the effects of drugs and substance abuse. This should be greatly supported by youth empowerment and more job creation in order to generally improve the standard of living especially amongst the age group identified. In addition there should be more focus on the enforcement of laws and penalties which should be enforced in order to keep a check and balance on the drugs problem, which has greatly affected the Nigerian society.